Canadian snowbirds who own cats or dogs will of course want to bring them to the U.S. for the winter each year. Whether you are travelling by air or by car, the rules for bringing in a pet are essentially the same, but what’s involved is vastly different and requires a lot of planning and organization. Read on for tips and guidelines to help you prepare for either mode of transport. Requirements to bring your pets to the U.S.
First of all, your pet must be healthy, look healthy and be well groomed or it can be turned away. It is required that all pets are up to date with rabies shots and other vaccinations and you should carry a document from your veterinarian certifying general good health and vaccination records. Although cats are not technically required to have rabies shots, many border guards will ask for it. It is also required for coming back to Canada. Before you travel, be sure to look at the websites of the departments that oversee the importation of pets (even though you are not importing your pet, you are subject to the same health requirements). In the United States, this is the U.S. Department of Agriculture (USDA). You can find regulations for importing pets on the USDA website. The Centre for Disease Control (CDC) website also has requirements for importing pets, including rabies vaccinations. Additionally, some States have their own requirements for bringing in pets, in particular, Hawaii, which imposes a quarantine period. It is also highly recommended that your pet be micro-chipped for identification purposes should he or she escape during travel or during your stay in the United States. Cats are required to be removed from their cat carrier and this can be problematic. Make sure you have gloves and the right clothing to deal with this. Start well before your travel date to thoroughly investigate the requirements for your pet to travel. Canadians who winter in countries other than the United States may still wish to bring their pets with them. If you fall into this category, be sure to research the pet importation requirements for your destination before you go, as regulations differ from country to country. It’s important to remember that you will be subject to inspection upon returning to Canada if you are bringing in a pet. The Canadian government agency that oversees the importation of animals is the Canadian Food Inspection Agency (CFIA). You can find rules and regulations about importing a pet to Canada on the CFIA website as well as information on travelling with pets on the Government of Canada website. If you have purchased your pet while in the U.S., different rules may apply so be sure to investigate the rules for importing an animal. Travelling by air is in many ways a simpler option than by car. However, it is extremely important to check with each airline as to their policies for carrying pets varies. This might influence your choice of airline, as some are more pet friendly than others. If your pet is small enough, they may be allowed in the passenger cabin but must be kept under the seat, not all airlines allow this, and it can even vary by time of year. So be sure to ask all the right questions before you book your flights. When you do book your flights, you must advise the airline at the same time that you will be travelling with a pet. Airlines have strict rules about the type of carrier your pet can travel in, so be sure to ask about that too and make sure you have one that complies. 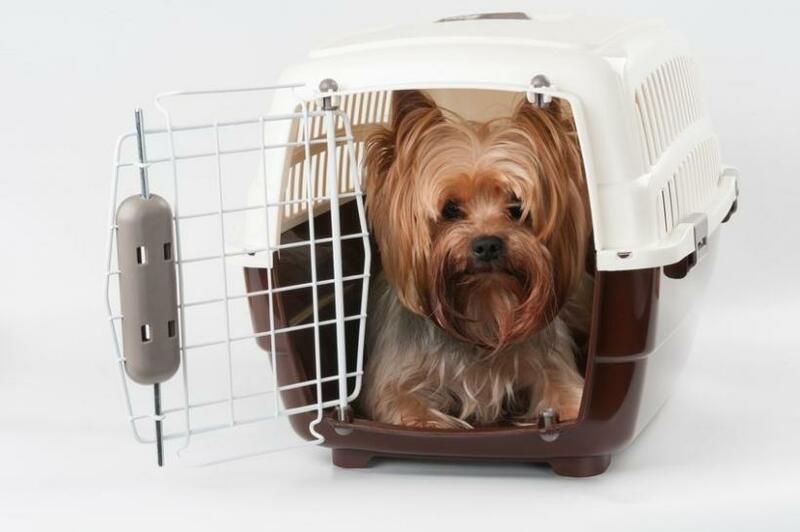 The carrier should be large enough for your pet to comfortably lie down and have adequate padding for comfort. There are specific rules for carriers that are allowed in the cabin, so again, be sure to ask. Many vets advise a mild tranquilizer for your pet before air travel. There are sprays for the carrier that relieve anxiety. Be sure to ask your vet about this and any other tips he or she may have. Before you go: Travelling by car with your pet requires significant preparation and planning. First of all, you will want to source hotels or motels along your route that allow pets. You can find this out by checking the websites of the many chains that operate throughout the U.S. Make reservations well in advance so your pet is not in the car any longer than necessary when you arrive. Many hotels do apply a surcharge. You can put the litter box on some newspapers next to the hotel toilet. Make sure you have sufficient food and treats for your pet’s journey and also check that you can import the food and treats you normally use. Otherwise you will have to stop once in the U.S. and purchase food there. Carry plenty of water and bowls for food and water. And be sure to take any medications your pet needs. Make sure you have a crate or carrier for the journey. It is wise to line the carrier with a number of puppy training pads, in case of any accidents or car sickness. Other useful items are paper towels, rubber gloves, leashes, trash bags, plastic spoons for tinned food, and rug cleaner for the car or hotel room. For cats you will want a litter box for the hotel and litter tools. En route: In the car, it is better if your pet remains restrained in a carrier or cage, this is for your safety and theirs. If you do open the carrier, do it with the car doors closed, as you don’t want to risk your pet escaping outside the car. Travelling through the southern U.S. even in the winter can still be very hot and if you are driving alone any rest stops should be kept to a minimum so your pet is not left in a hot car. Dogs can be taken out of the car on a leash for bathroom breaks and to eat and drink, however, cats are best kept in the car and fed and watered there, to prevent any chance of escape. Choose the fastest and most direct route using interstate highways. This is not the time to take scenic, mountain routes. Many pets get carsick, especially on high and winding roads. The best thing for your pet is to get to your destination as soon as possible.